Alston in the North Pennines is surrounded by a unique landscape of moorland, hills, rivers and waterfalls and is one of England’s highest market towns (being about 1,000 feet above sea level). Designated Britain’s first UNESCO European Geopark, the North Pennines Area of Outstanding Natural Beauty (AONB) is a haven for special wildlife and plants. Surrounding the town is Alston Moor, a beautiful and diverse area known for its rare alpine flora and moorland birds such as black and red grouse, lapwing, meadow pipit and merlin. 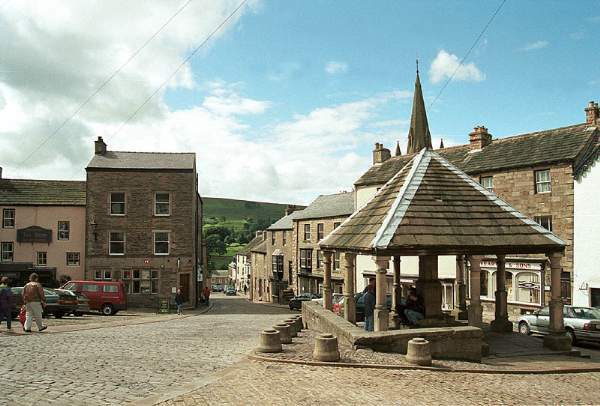 This intriguing town with its cobbled streets and fascinating nooks and crannies has been the location for ITV productions of Jane Eyre and Oliver Twist. Alston also featured on BBC2’s Britain’s Heritage Heroes in 2013, as John Craven found out more about the mining industry in the area. The North Pennines used to be one of the wealthiest lead mining centres in Europe and the nearby Roman fort of Whitley Castle (Epiacum) was sited to control and protect the lead mines there. St Augustine’s Church in Alston was built in 1869, but records show a church has existed on the site since 1145 AD. Inside the church is an interesting clock, brought from Dilston Hall, the home of the Earl of Derwentwater. The North Pennines have long inspired artists and writers. The poet and writer W H Auden loved the area and described the landscapes around Alston as his ‘great good place’. Alston is an inspiration to the crafts people who live and work there. There’s a host of unusual shops in the town including quality crafts and galleries.